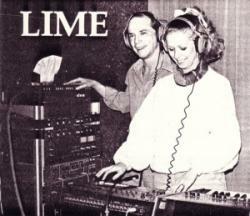 Lime was a synth music outfit from Montr�al, Canada. The group was composed of husband and wife Denis and Denyse LePage. Lime is most noted for its songs "Your Love" (1981 #1 US Dance), "Babe, We�re Gonna Love Tonight" (1982), Guilty (1983),"Angel Eyes" (1983). "Your Love" was featured in the 1982 movie Summer Lovers. Very early in their career, the group released an instrumental 12" single vinyl record called "The Break" under the name Kat Mandu. The single was successful and peaked at number three on the disco chart. Singer Denyse also wrote and sang on the record "Dancin' the Night Away" by Voggue.